We've all been there - situations in which we would give anything for a little relief. roadbag® is the answer to this problem. Whether you're stuck in traffic or attending an open-air festival, on a camping trip or in a small plane - roadbag®, the go-anywhere urinal, offers relief no matter where you are. 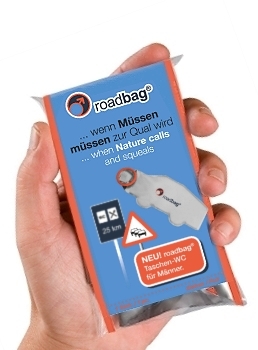 roadbag® is safe, convenient, hygienic and easy to use. The secret behind roadbag® are super-absorbent polymers: Special super-absorbent granules within roadbag® quickly absorb the urine and trap it, forming a gel. That means no dripping, no spills - and no unpleasant odours. For clean hands once you're finished, a moist towelette is delivered with each roadbag®. Convenient and clean, from start to finish.